It is related to software engineering. Labeling revisions to configuration items and baselines. Understanding the status of configuration items as they progress through the development process. Keeping detailed and accurate records of the above in a CONFIGURATION ITEM REGISTER. An integrated backup panel (IBP) that allows operators to take manual control of the system. The figure illustrates the configuration identification record for one of the stations (Central). Here are several real-life scenarios where failure to properly identify a configuration has caused financial loss. Scenario 1 - Which Software is this? An installation engineer located in Hong Kong experiences regular control system crashes. The Brisbane based development shop can't reproduce the problem in its test environment. After a week of investigation (cost = $5,000) a development engineer discovers site engineers have installed the wrong release of a configuration file in a remote terminal unit. 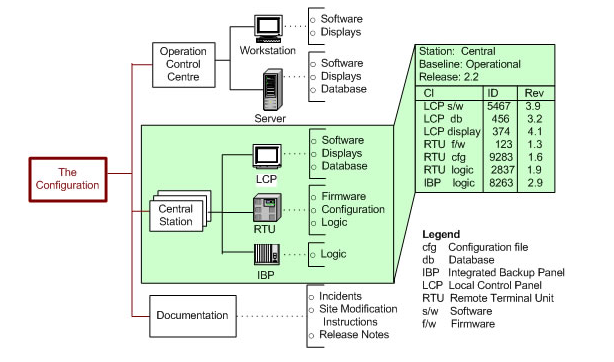 Solution: The central supervisory computer software is upgraded to automatically check the configurations of all remote units against an automated configuration item register. A new software release works fine for two weeks then catastrophically fails when a new feature is used for the first time. We have to revert to the previous release to recover (real quick). Solution: Keep a Configuration Item Register that describes the evolution of the software product. Note that this function is usually performed by a source code control system, however a manual record may have to be kept of the documents that describe various versions of hardware and software configuration items. A software house goes bankrupt because it cannot reliably build its core product. See sidebar How Embarrassing Is This. Solution: In your next job, as your first priority, set up a configuration register and pay more attention to configuration identification. IS YOUR CONFIGURATION ACCURATELY IDENTIFIED?